In the same way that metamaterials steer light around objects to hide them, they might also steer electrons through crystal lattices with zero resistance, say physicists. Metamaterials are one of the wonders of modern physics. Made using repeating 3D patterns of electronic components such as capacitors and resistors, metamaterials interact with light waves, steering them in ways that are impossible with ordinary stuff. The result: more invisibility cloaks than you can shake a wand at. But there is no magic at work. The general theory that explains this is known as transformation optics. And the mathematics behind it is formally analogous to the equations that describe how mass warps spacetime to generate gravity. That’s why physicists have been able to use a metamaterial to simulate the way that a black hole traps light. Now Igor Smolyaninov and Vera Smolyaninova at the University of Maryland in College Park say metamaterials may be formally linked to another area of physics: superconductivity. In particular, they say that superconductors may be a special form of metamaterial that steer electrons instead of light. That raises the tantalising possibility that the secret to high temperature superconductivity could lie in the development of a new generation of metamaterials that exploit this idea further. First, some background. Superconductivity is the phenomenon of zero resistance in materials cooled below some critical temperature. Superconductors also expel magnetic fields, a phenomenon known as the Meissner effect. For many years after the discovery of superconductivity in 1911, physicists were puzzled about how it arose. Then, in 1957, John Bardeen, Leon Cooper and John Schrieffer solved the problem using what is now known as BCS theory. Their idea is that at low temperatures, electrons double up to form Cooper pairs which travel through the material lattice together. They do this with zero resistance by exchanging phonons—quantum particles of vibration–with the lattice. In effect, the copper pairs are swept through the lattice by these phonons, which clear the way of obstructions, such as other electrons. That’s why there is zero resistance. This ability to steer electrons may sound familiar. Indeed, the Smolyaninov and Smolyaninova say that high temperature superconductors such as BSCCOs (bismuth strontium calcium copper oxides which superconduct at over 100 K) have a formal similarity with the metamaterials that physicists have already built to steer light. That’s because they consist of layers of atoms with metallic properties interspaced with layers of atoms that have dielectric properties (see diagram). In effect, they are the ultimate metamaterials constructed on the atomic scale. That raises the fascinating prospect that physicists might one day engineer superconducting metamaterials of their own. And with a better understanding of exactly how these layers steer electrons with zero resistance, it might even be possible to make materials that superconduct at higher temperatures than are possible today. 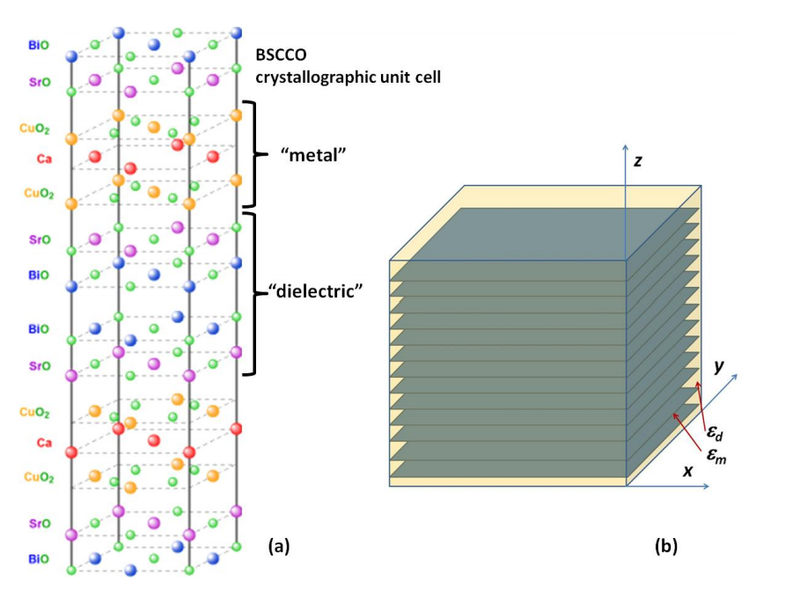 “We argue that the metamaterial approach to dielectric response engineering may considerably increase the critical temperature of a composite superconductor-dielectric metamaterial,” they say. Do we hear room temperature? Perhaps not yet. This is just an idea at present and numerous significant challenges lie ahead. The first is to find a way to design a superconducting metamaterial and predict its superconducting properties. After that would come the significant challenge of synthesising it. Both of those feats look to be some way off. Nevertheles, the science of metamaterials has evolved rapidly. In a mere ten years, it has gone from fantasy book fiction to the construction of working invisibility cloaks, artificial black holes and even synthetic universes. Which is why only a fool would bet against superconductivity being the next notch on the metamaterial bedpost. Ref: arxiv.org/abs/1311.3277 : Is There A Metamaterial Rout To High Temperature Superconductivity?